Tonight that same map appears on your agenda for final action because, as noted in the agenda directions, “the Committee needs to send a plan to the Planning Board for their review on October 1st ….” Even by the twists and turns that have become a defining characteristic of the Central West Steering Committee, the abrupt switch in one week from a map being “a first draft and starting point for … discussions” to being an action item is a astounding change in direction. 1) A key problem with the plan on the table is the failure of this plan to have a set of defensible performance standards for traffic and flooding, presuming that performance outcomes are to be part of the assessment for potential developments. 2) The plan does not identify square foot maximums for each developer (you can’t have both flexibility of building placement and no sense of maximum square footage and still have meaningful protection for surrounding neighborhoods). 3) The whole issue of Estes Drive is unaddressed in the plan under consideration, leaving it unclear, for example, the maximum number of lanes that might be added as part of traffic mitigation procedures or precisely what features will promote the safety of school-age children and other pedestrians (part of this latter issue may be addressed this evening). 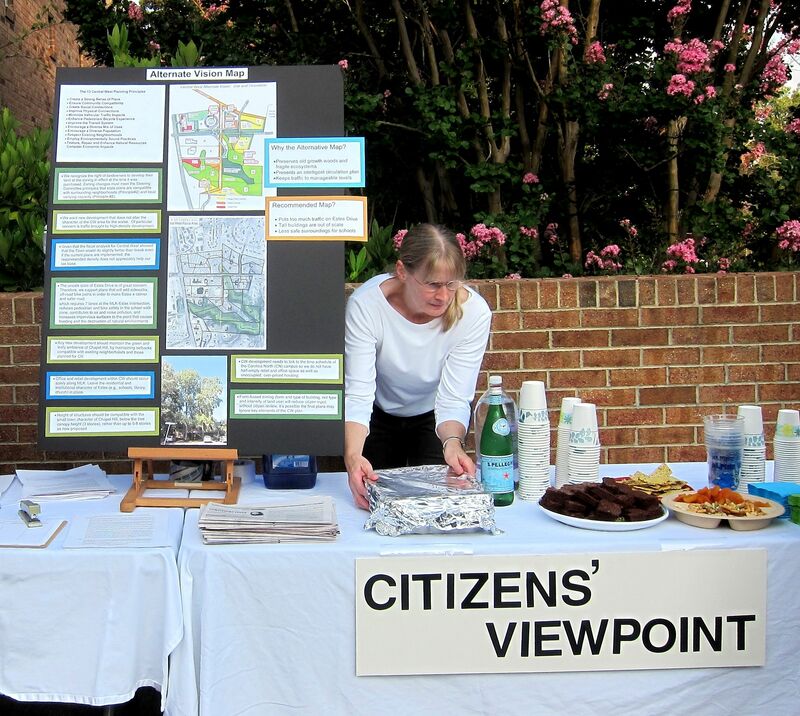 4) Yet to be discussed and resolved is whether senior housing can be appropriately placed on a ridge with nearby steep ravines in one of Chapel Hill’s last remaining near old-growth forests. 5) The southward extension of Somerset would entail it crossing a drainage area, both an expensive road to build and an environmentally questionable proposal. 6) While the map states that intensity decreases as one moves eastward on Estes, it is hard to see on that map how that claim is true. 7) Even though we now know that Carolina North is going to be phased in slower than originally expected, no provisions are apparent on the map for accommodating Central West development to the phase-in of Carolina North. These 7 unresolved areas — other people no doubt can add to this list — are significant, and it is not surprising that these areas are unresolved. After all discussion of this new map has just begun, and the Steering Committee has only recently started to talk to one another in a serious way. In the absence of a skilled facilitator and with a committee charge that has morphed periodically, the Steering Committee has seemed to spin in circles for much of the past 6 months. When the Town Council established the Steering Committee membership last October, the Council made the committee membership broadly representative of the interests of the community, ranging from landowners to institutional representatives to residents of Central West. This was a design to promote, if not compel, consensus, and the Steering Committee early on adopted consensus as a goal. Now is not the time to shortcircuit that goal. I urge you to persist and to work for consensus so that the interests of everyone around the table are preserved and the final small area plan has the support of all of you. Four steering committee members, David Tuttle, Firoz Mistry, Mickey Jo Sorrell, and Julie McClintock, presented this letter to their colleagues at the September 4 steering committee meeting. They requested that that this new proposal be discussed and that it be shared with the public at the September 10 outreach session at Amity Methodist Church. The committee declined to allow the letter at the workshop. Not to be deterred, citizens gave out the letter at the door.